Investible sectors from rural India include Farm, Rural Infrastructure, Consumption and Financial Services. 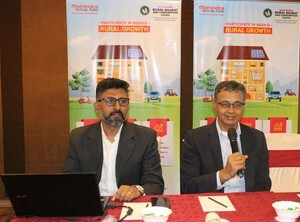 Mahindra Financial Services Limited (MMFSL) launches new open ended equity scheme ‘Mahindra Rural Bharat and Consumption Yojana,’ for investors who are seeking long-term capital appreciation by investing predominantly in equity and equity related instruments of entities engaged in and/ or expected to benefit from the high growth of Income & Consumption in rural India. Mr. Jatinder Pal Singh, CMO, Mahindra Mutual Fund, The scheme would endeavor to generate capital appreciation by investing in entities and businesses that are engaged in and are expected to benefit from the structural shift and growth in Rural India. This would include several sectors that are likely to benefit consistently due to improvement in income & Consumption of rural India. Various structural reform initiatives such as the soil card, crop insurance, higher MSP, e-Mandi and Doubling of farm Income have the effect of sharply increasing rural disposable income. The New Fund Offer opens on October 19, 2018 and closes on November 02, 2018. The scheme will reopen for continuous sale and repurchase within 5 business days from the date of allotment. Mahindra Rural Bharat and Consumption Yojana would provide investors an opportunity to invest in a segment with strongest contribution potential to India’s growing GDP. The fund will focus on segments insulated from global volatility such as currency movements, etc and invest in companies that can capture the under-penetration opportunity in Rural India. The scheme would invest minimum 80% in equity and equity related instruments of entities having exposure towards rural India, and upto 20% in equity and equity related instruments of entities other than having exposure to rural India. The scheme would invest upto 20% in debt and money market securities, and upto 10% in units issued by REITs & InvITs. Mahindra Asset Management Company Private Limited, a company incorporated under the Companies Act, 1956, is the Investment Manager for Mahindra Mutual Fund. It is a wholly owned subsidiary of Mahindra and Mahindra Financial Services Limited (MMFSL).Mahindra Mutual Fund endeavors to offer a variety of mutual fund schemes pan-India, with special focus in rural and semi-urban areas. Statutory Details: Mahindra Mutual Fund has been constituted as a Trust under the Indian Trusts Act, 1882. Sponsor: Mahindra & Mahindra Financial Services Limited. (liability of Sponsor limited to Rs. 1,00,000/-) Trustee: Mahindra Trustee Company Private Limited. Investment Manager: Mahindra Asset Management Company Private Limited. The Sponsor, Trustee and Investment Manager are incorporated under the Companies Act, 1956. Mahindra & Mahindra Financial Services Limited (Mahindra Finance), part of the Mahindra Group, is one of India’s leading non-banking finance companies. Focused on the rural and semi-urban sector, the Company has over 5.5 Million customers and has an AUM of over USD 8.5 Billion. The Company is a leading vehicle and tractor financier and also offers fixed deposits and loans to SMEs. The Company has 1,291 offices and reaches out to customers spread over 3,50,000 villages & 7,000 towns across the country. Mahindra Finance is the only Non-Banking Finance Company from India to be listed on the Dow Jones Sustainability Index in the Emerging Market Category. Mahindra Finance has been ranked 14th on the list of India’s Best Companies to work for 2018, by Great Place to Work® Institute. We have also been recognized as an Aon Best Employer 2017 and among the Best BFSI Brands 2018 by The Economic Times. Mahindra Asset Management Company Private Limited (MAMCPL), a wholly-owned subsidiary of Mahindra Finance, is acting as the Investment Manager of Mahindra Mutual Fund.